Salman Hameed is Charles Taylor Chair and an associate professor of integrated science & humanities in the school of Cognitive Science at Hampshire College, Massachusetts. He is also the director of the Center for the Study of Science in Muslim Societies (SSiMS). His primary research interest focuses on understanding the reception of science in the Muslim world and how Muslims view the relationship between science & religion. He recently led a 4-year National Science Foundation funded study on the reception of biological evolution in diverse Muslim societies. He is also leading a study to understand and analyze the discourse and participants in online Islam and Science videos. He teaches “Evolution, Islam, and Modernity,” “Science in the Muslim world,” "Creating science fiction short films using real science" (with Dr. Jason Tor), and “Science & Religion: Biological evolution in the public sphere” at Hampshire College. Salman also runs Irtiqa, a science & religion blog with an emphasis on scientific debates taking place in the Muslim world and hosts an online astronomy video series in Urdu, Science ka Adda. He also has a weekly segment with morning D.J. Monte Belmonte for Northampton radio station, WRSI - The River (FM 93.9), and a monthly segment titled "Musings on the Ridiculously Large and Largely Ridiculous Universe" on The Bill Newman Show on WHMP (FM 96.9). During the election campaign, Donald Trump often made statements about Muslims in the U.S. This type of rhetoric has been used quite frequently by some of the far-right groups in Europe. Therefore, there is an urgent need to understand the dynamic of cultural interactions that define Muslim minorities in Europe, and the way these interactions are used in domestic and international politics. Gender-related issues and radicalization of Muslims are two topics that frequent the headlines. But now science is also becoming one of the contested issues. For example, a rejection of biological evolution is increasingly being used by the media and the far-right groups in Europe to paint Muslim minorities as outsiders that threaten the European education system. Furthermore, Muslims are often treated in a unitary manner with an assumption that evolution rejection is their default religious position. Conversely, many Muslims in Europe are embracing this rejection of evolution as an identity marker for being a Muslim. While religious objections to evolution are indeed at play in some cases, our understanding for the rise of Islamic creationism should also take into account socio-economic disparities and their impact on education for Muslim minorities in Europe. A nuanced understanding of this dynamic may benefit those who support both the propagation of good science and favor cultural pluralism, and may also provide an insight into more politically charged subjects, such as debates over free speech and women’s religious attire in Europe. Furthermore, a look at these issues in Europe also may cast evolution battles in the U.S. in a different light. Clouds of controversy surround the summit of Mauna Kea on the Big Island of Hawaii. Astronomers know Mauna Kea as home to world-class observational facilities, such as the W.M. Keck Observatory and Subaru telescope, its clear skies and unobstructed views virtually unmatched by any other site in the world. Not surprisingly, Mauna Kea has been picked as the site for the new Thirty-Meter Telescope (TMT), which will be the largest optical telescope on the planet. However, Native Hawaiians view the mountain as sacred space, an anchor for Hawaiian identity. Many Native Hawaiians oppose new construction as a continued desecration of the mountain. Mauna Kea also hosts a sensitive alpine environment that serves as a fragile home to potentially endangered species, such as the wekiu bug. For these reasons, the future of astronomy on the mountain is in doubt. The tension between these groups has been building for some time, but recent events reveal the seriousness and intensity of the conflict as well as the challenges associated with the delicate business of crafting policies that respect divergent worldviews. ICE Fellow Salman Hameed will present an analysis of the conflict and place it in the larger context of contemporary cultural, and science & religion, debates. 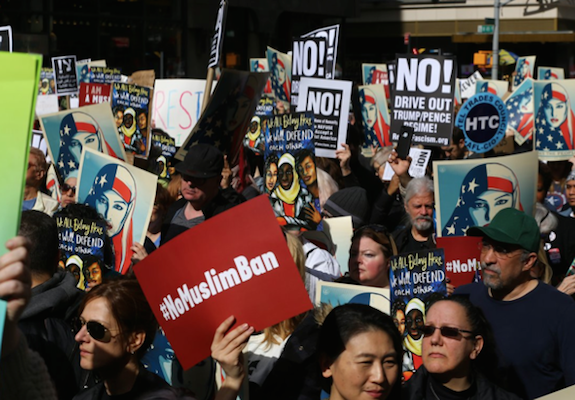 What will be the immediate and long-term impacts of President Donald Trump’s travel ban from six Muslim-majority countries on science, education, and broader international relations? Salman Hameed, an astronomer and director of the Center for the Study of Science in Muslim Societies (SSiMS) at Hampshire College in Massachusetts, will address some of these topics. Presented in conjunction with the Department of Asian and Middle Eastern Languages and Literatures, Department of Religion, Sierra Club Upper Valley Group, Upper Valley Refugee Working Group.